Managing workspace documents using Microsoft Office is a common feature of Enterprise Content Management Systems. 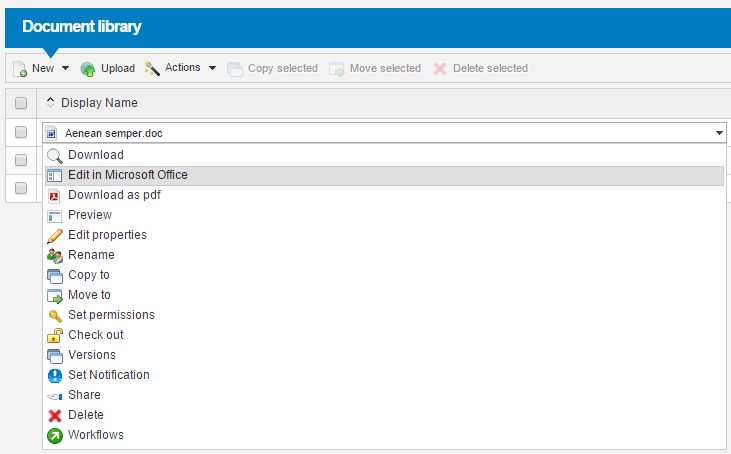 Using sensenet you are able to create, modify or delete documents within Office. Editing and publishing documents into a workspace is as easy as managing tasks or links as well. 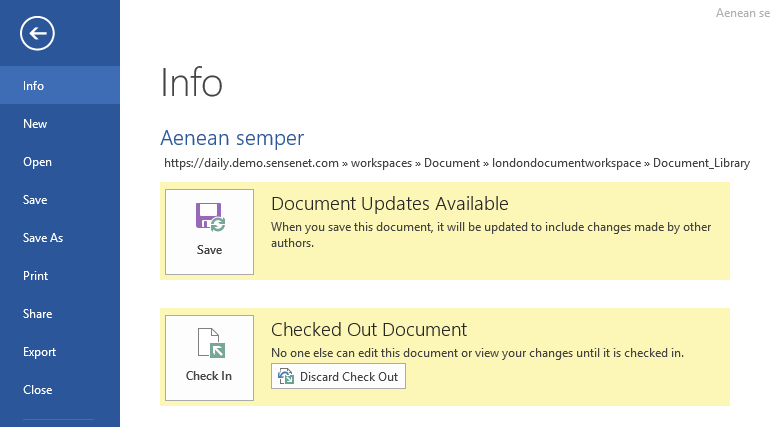 There’s no need to learn how to upload documents or other files into sensenet workspaces manually, it’s done automatically while you’re using Office. 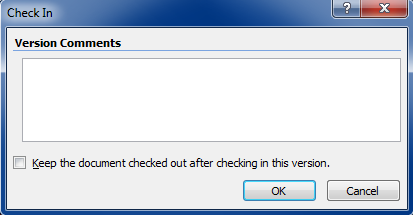 This feature is fully compatible with Microsoft Office 2013, 2010 and 2007. The feature has been tested with Microsoft Office Word 2013, Microsoft Office Word 2010, Microsoft Office Word 2007, Microsoft Office Excel 2013, Microsoft Office Excel 2010 and Microsoft Office Excel 2007. The following information is only valid for these versions of these two programs. Please note that Office 2013 support has been introduced in sensenet 6.3, Office 2010 support in sensenet 6.1, versions prior to this only support Office 2007. - From the 1st of September 2015 Chrome does not support NPAPI plugins any more. - Edit in Microsoft Office feature will not work in Chrome in sensenet versions prior to 6.5. - sensenet requires Windows authentication or SSL HTTP connection in order to manage Office documents. 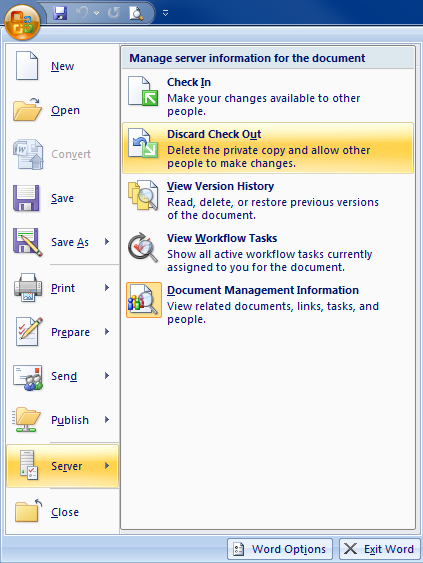 - Otherwise you will see a greyed out menu item in document action menus. Office may not allow you to open documents from sites that are not in the list of Trusted Sites. To set up your site as a trusted site open Internet Explorer then go to Internet Options. On the Security tab select Trusted sites then click Sites. In the following window add your site’s url to the list. Only users with sufficient permissions are allowed to use Office protocol functionality. The system files that handle Office protocols are located under /Root/System/WebRoot/DWS folder. 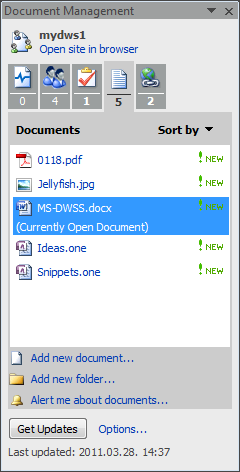 Add See and Open permissions to users in order that they can access document management functionality from Microsoft Office (see WebRoot Folder for details and examples)! Also, sufficient permissions have to be granted to users on Content Repository Workspaces and Documents for them to be able to access and open documents, and to Applications for them to be able to invoke certain Office document management functionality via actions. Prerequisites: this section is about a feature that requires the SenseNet.WebPages component or the full sensenet 6.5 application to be installed. You can open a document from portal by clicking on the Edit in Microsoft Office action from the action list. If you have Microsoft Office 2010 or Microsoft Office 2013 on your computer, you can open documents with ‘Edit in Microsoft Office’ action. It works in Internet Explorer, Firefox and Chrome. If you have Microsoft Office 2007, you can use this action only in Internet Explorer. 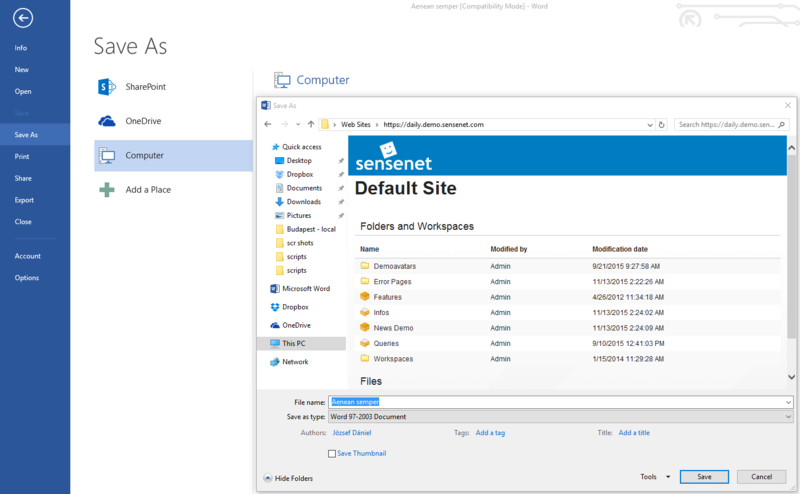 Please check out the WebDAV article about configuring and using WebDAV with sensenet. 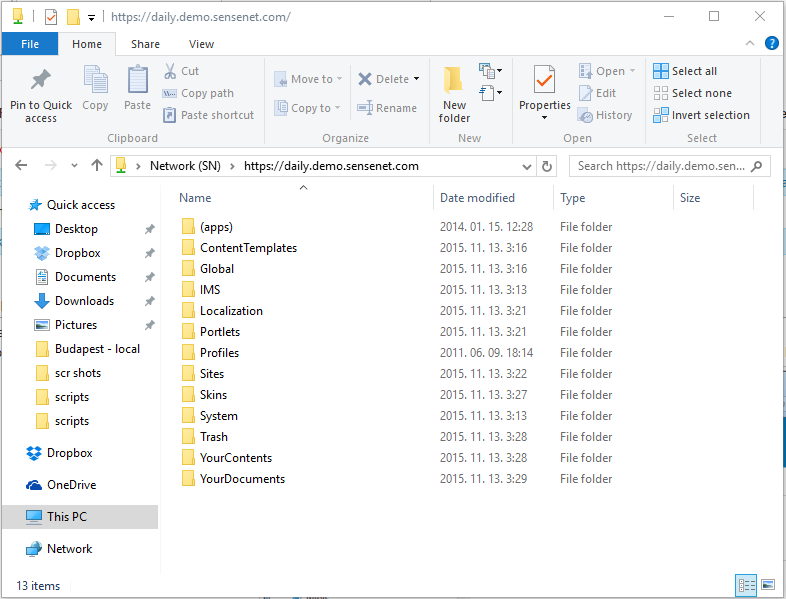 Opening a file by double-clicking it in a mapped network drive in Windows Explorer opens it automatically in Office the same way as you would open it from the UI. 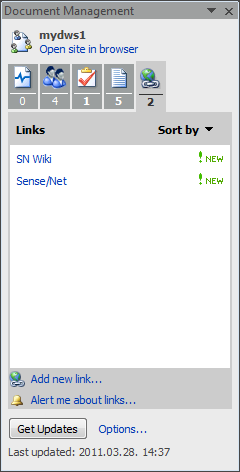 You can always use the Favorites folder on the left side of the navigation bar to store the location of the server simply by right clicking Favorites and selecting Add current location to Favorites - to avoid typing the url of the sensenet server all the time when opening a document from Word. Document Workspaces tab contains shortcuts to all document workspaces in the Content Repository. By clicking on them the window will be navigated to the selected workspace where documents can be found under the DocumentLibrary folder. 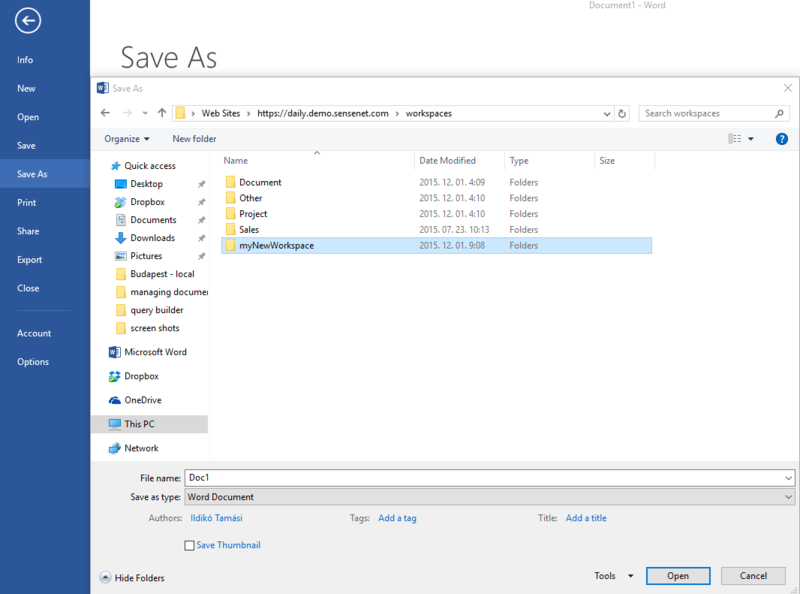 In the Save as dialog type the url of the document server into the File name text box then press enter. A custom sensenet workspace window will appear where you can select the desired Document_Library folder you want to save your document in. You can use the Save as dialog similarly as the Open dialog: if you don’t want to type the url of the server, you can store the address in the Favorites folder. This option however is only available when selecting Save As, and is not present with the Publish feature. - as Office does not check it out automatically in the current implementation! - The Check Out button in this case is only available in the Office button / Server menu. - See the 'Document source control' section later in this page. You can also create a new workspace for your document with Microsoft Office 2007. To do so click on the Office button then select Publish \ Create Document Workspace instead. 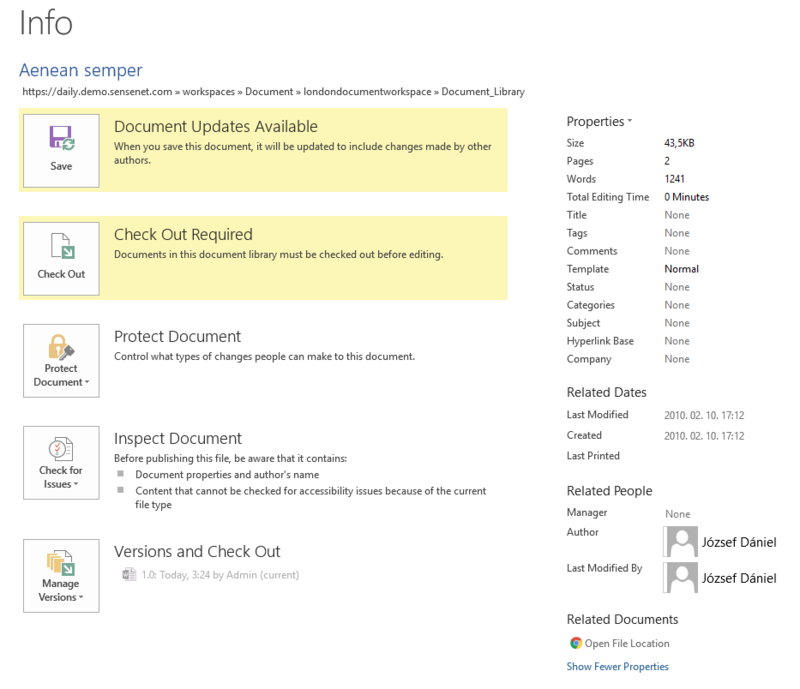 The Document Management pane will appear. 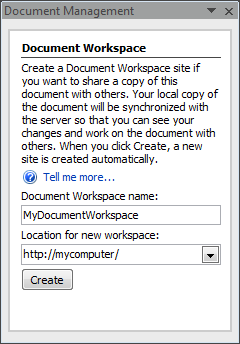 Choose a name for the workspace then type the url of the document server into the Location for new workspace text box. Click Create to finish creating a new workspace. The Location given is treated as site relative, so entering myworkspace and http://localhost will create the new workspace with the path /Root/Sites/DefaultSite/myworkspace. You may as well give absolute url’s: http://localhost/Root will create the workspace directly under the /Root content. 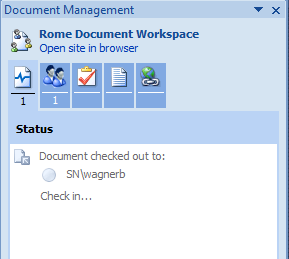 After you open a document from a workspace the Document Management pane will appear. 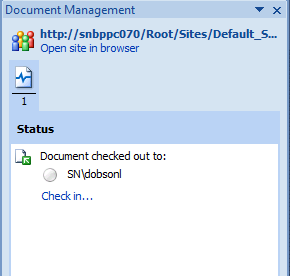 If not, you can make it visible by clicking on Server \ Document Management Information under the Office menu. The Document Management pane is only capable of displaying a single document library, a single task list and a single link list only. The name of these lists and their workspace relative paths in the Content Repository must be /DocumentLibrary, /Tasks and /Lists, respectively. It is possible however to open a document from another Document Library, other than /DocumentLibrary - in this case only the current library’s documents can be accessed from the Document Management pane. 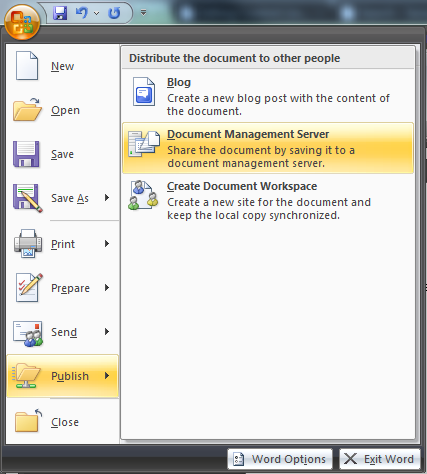 The Document Management pane only works for documents opened from the Document Libraries of Workspaces - but not for documents under a Site, Trash Bin or a Document Library defined outside of a Workspace, even though the document source control features (see later) will work for all documents in the Content Repository regardless of their locations. List of available members associated to the Workspace. List of available tasks in the Workspace. List of available files and folders in the Workspace. List of available links in the Workspace. 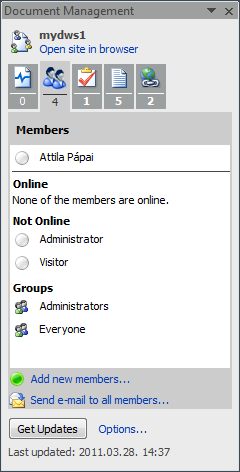 You can not manage members directly from Word but you can still see who is available (and who is online in MSN). Members are defined by explicit permission settings on the workspace content. This means that you can add new members by adding permissions to users on the workspace (add them explicitely if you want them to be displayed on the members tab even if they are already contained in any of the groups having permissions on the workspace). Tasks are also important content of a workspace. You have full control on managing tasks in the current workspace within Office. You can set a task completed by clicking the checkbox next to it’s title. An empty check box means that it’s state is Pending. A checked task refers to a Completed task. In any other cases, you’ll see a filled checkbox. 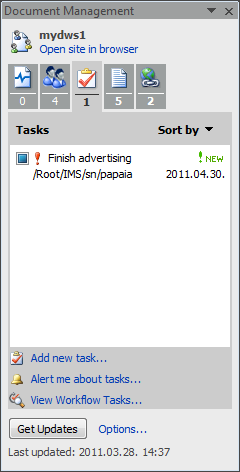 Depending on the status of the task an icon is placed next to the checkbox to visualize it’s state. After creating a new task it won’t be visible until Get Updates button is pressed. If you create your own MyTask Content Type make sure you inherit from the base Task Content Type or any of its descendants in order to make it visible in the list. Any documents, associated to Office, in the Document Library folder of the current Workspace is visible and can be opened, edited or deleted, if the user has enough permission for these operations. You can also create or delete folders. After creating a new link it won’t be visible until Get Updates button is pressed. If you create your own MyLink Content Type make sure you inherit from the base Link Content Type in order to make it visible in the list. 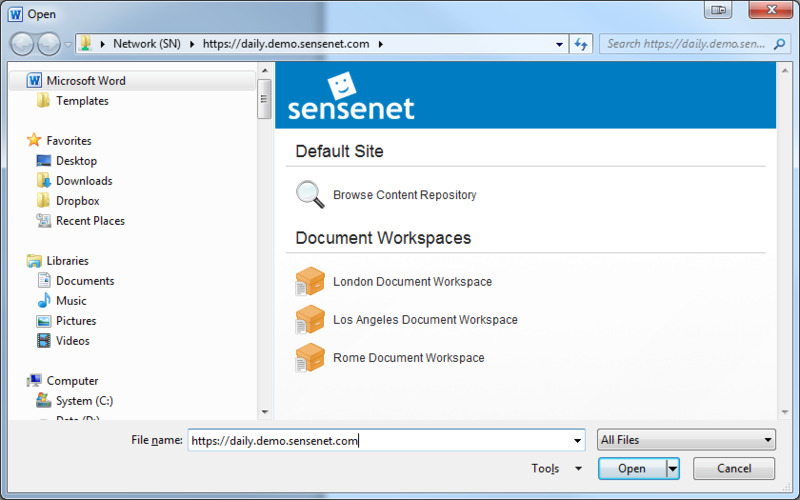 You can configure sensenet to automatically check out documents upon opening. This is handled by the AutoCheckoutFiles web.config key in the sensenet/webdav section. 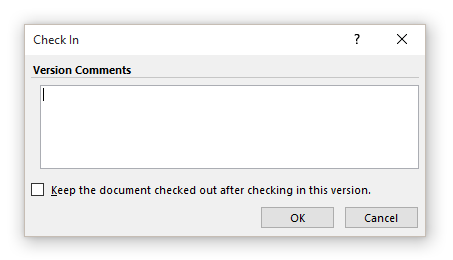 If you set it to true, documents will automatically be checked out to the current user when opened in Office and automatically checked in when closing Office. A Checkin comment in Office can always be given and will be stored in the Content Repository for the given version even if checkin comments are switched of or not available for the given document on the portal. A Checkin comment in Office is never required and therefore empty chekin comments can always be given in Office even if it is required to fill out on the portal. Office also supports a third action called Discard Check Out. Undoing a checkout means losing all the changes made to the current document and unlocking it to others (equivalent to Undo changes on the portal). This action can be found under the menu Server. When this happens, simply click the Office button / Server / Check Out button, and the document will be checked out, and you can instantly check it in by clicking the Check in… link already discussed above. select Restore to restore the previous version. 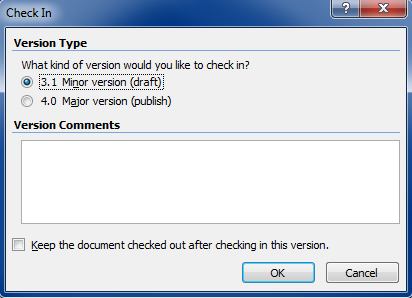 In this case a new version will be created with the contents of the selected version. The Delete version operation is not supported in sensenet. You can find examples for permission settings under WebRoot Folder section.